Little, Brown Books for Young Readers, 9780316077910, 32pp. Fred Stays with Me! 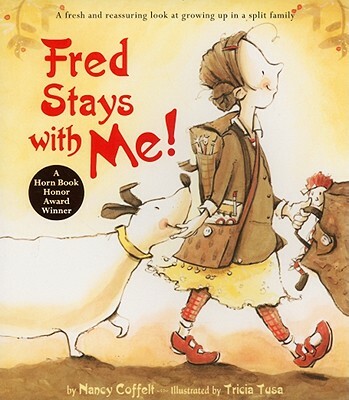 is an award-winning story that follows a young girl who turns to the one constant in her life, her dog Fred, in the face of her parents' divorce. In this poignant but not overly sentimental story, Coffelt's accessible and kid-friendly language alongside Tusa's charming artwork create a light, cheerful, and reassuring mood that will comfort any child who has two homes. Nancy Coffelt is the award-winning author/illustrator of a number of picture books for young readers, including Dogs in Space, Pug in a Truck, and most recently, Big, Bigger, Biggest! She lives with her family in Portland, Oregon. Her website is www.nancycoffelt.com. Tricia Tusa has written and illustrated several critically-acclaimed picture books, including Wing Nuts: Screwy Haiku; The Magic Hat; and Mrs. Spitzer's Garden. She lives in New Mexico.